The Norman Church of St. Mary’s that we see today was built between 1150 and 1200, but was preceded by a smaller one that is listed in Domesday Book of 1086. Whether or not it was a Saxon building is not certainly known but the manor of Mapledurham, of which Buriton was the centre, was Saxon. There have been many alterations and parts rebuilt since the 13th century so that the interior of the church today must bear little resemblance to the original appearance. The nave and chancel do date from the 13th century and the finely proportioned east window dates from 1280 although the stonework was refashioned and repaired with new glass in 1887. The tower is now a plain structure with a clock facing west. The original tower, with four bells, was destroyed by a fire caused by lightening in 1712. The Churchwarden’s book records: “Monday morning between 4 and 5 of the clock, the 17th day of November anno 1712, Berriton Steeple, being shingled and about 80 foot high, took fire by a very terrible tempest of thunder and lightening nigh the top and was burn’d down.” It was rebuilt, and five new bells hung, in 1715. All of the bells have been re-cast and re-hung since then and a sixth bell was donated by Mrs Seward of Weston in 1935 in memory of her daughter. A former clock, with a face high up on the north side of the tower, was put up in 1717 at a cost of £20. The position of this former clock is still outlined in the stonework and would have shown the time to the Manor House and to the farm labourers. Be sure you pay, make no demurs. 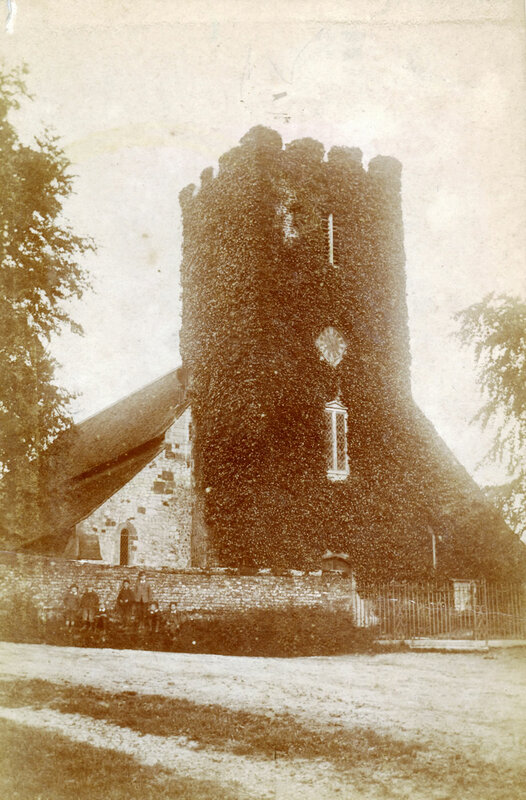 The church was closed for a year in 1877-78 for extensive restorations which included a new roof, repairs to Nave arches and new screens and seating. During this time, the school was used as a church although at least one marriage took place “in the church without a roof”. St. Mary’s is large for a village Church, having been the mother Church for a parish of 6,000 acres including Petersfield and Sheet. It was not until 1886 that Petersfield with Sheet became a separate parish. A church orchestra, in a musician’s gallery at the west end, was succeeded by a barrel organ until 1897 when the pipe organ was given by Mrs Bennion. Central heating was presented by Mr Bennion in 1896 replacing a stove which had stood at the rear of the church in the west end of the nave. It is said that the men took up all the back seats at this time! Electric lighting was installed in 1938, replacing 19 oil lamps which were used in winter and candles which were used in the summer. From certain angles the church appears as though it is crouching and this may be due to the fact that the surrounding ground, the churchyard, has risen by about 2 feet 6 inches – having been the resting ground for local people for close on 1,000 years. Records show that in 1830 the ground was moved from the walls of the Church down to the inside level and brick gutters were laid. This shows quite vividly how much the ground has risen through the years. The Rectors of Buriton received income from the Tithe for the whole parish. They would also gain some additional income from letting some of the glebe land for allotments, potato patches and shooting land. In a note written for his successor in 1889, the Reverend John Gedge recorded that the local squire, John Bonham-Carter, paid six pounds a year in advance for land retained for shooting and that allotments were let at three pence a rod to railway workers, limeworkers, a wheelwright and one of the village publicans. From their income the Rectors would have to meet some of the parish expenditure: paying the organist, contributing towards the cleaning of the church, subscribing to the school, to the choir fund and to a local clothing club. As well as subscribing to the many village charities, the Rector would often be the manager, treasurer and secretary of many of them. The Rectory would be the hub of social welfare in the village with the poor depending upon the Rector as much as upon the Relieving Officer. The Rector would administer all sick relief in the parish, in money or in kind. Stores of cod liver oil, malt and linseed meal were kept at the Rectory and occasional gifts in kind, such as vegetables, soup, puddings, beef tea, eggs and even Sunday dinners were given out. Poor relief was paid weekly to those in need, the Relieving Officer coming from Petersfield every Tuesday to deal with this. The Rector would also play an important role in clubs in the village which were established to help residents to be thrifty (a Children’s Shoe Club, a Clothing Club and a Coal Club) and his influence would extend to the social life of the village through support for Mothers’ Meetings, a Girls’ Friendly Society and the Mothers’ Union. 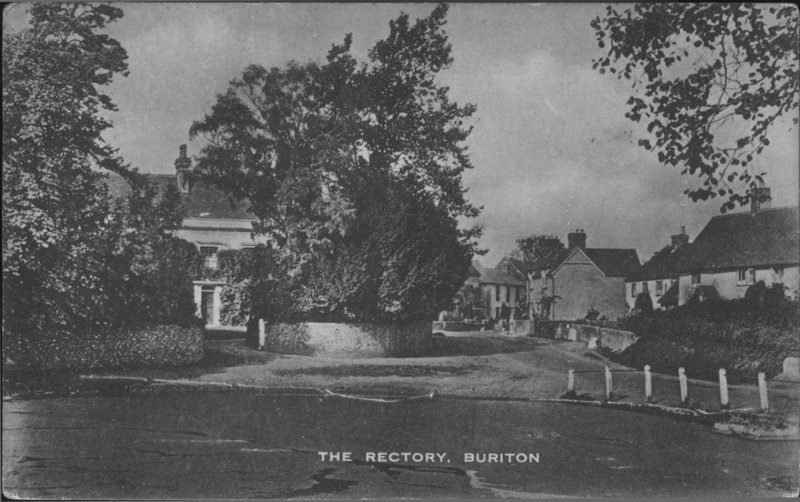 The Rectors lived in what is now The Old Rectory, by the village pond, until 1952. Mary Piggott (1911-1998) recalled outings in the early part of the 20th century such as “going to Nursted House where we had trips on the pond in rather a leaky boat rowed by Mr. Bennion. Sometimes we had a Magic Lantern show, and of course there was plenty of food. I also remember Choir outings to Bognor and to Ryde; the former by charabanc, the latter by train and boat. There was much competition for a place by the window of the train so that we could wave to those left- behind in the village.” Church fetes in the Rectory gardens were another common occurrence with fancy dress parades, country dancing, stalls and side-shows. Another special feature of St. Mary’s church was the annual toy service conducted by Cannon Morley from 1936. The service, held in conjunction with the harvest festival, would be pre- ceded by a band leading a procession to the church. Visitors and representatives from many societies came from far and wide, bringing toys which were offered at the alter. The services were relayed by loudspeakers outside the church to those who were unable to find room inside. Many hundreds of toys were received each year and were given to various hospitals. 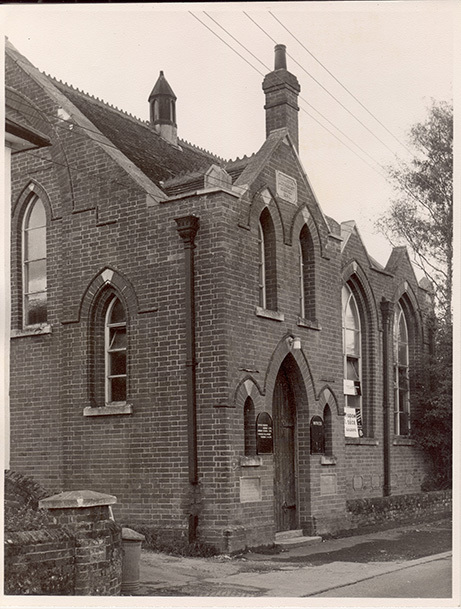 A chapter of Buriton history came to an end in October 1980 with the closing of the Methodist Chapel. The chapel had been opened on July 23rd 1847 and was the centre from which a number of surrounding Methodist chapels sprang – the Buriton Mission Circuit. The Forder family, who started Buriton limeworks, gave an annual donation to the Chapel and many of their workers worshipped there. The building itself had seen many changes which reflected the growth and decline in the numbers of worshippers. At first it was small, but an extension (where the Forder House offices are now) was built in 1882 for about £200. A further extension (fronting onto the High Street, where Chapel Cottage has recently been built) was constructed in 1894 for about £500. In 1967, however, engineers were called in because of problems with the walls. The 1894 extension was demolished and the original building and 1882 extension modernised at a cost of £2,250. In 1980 the chapel was regretfully closed as it was felt that a further £2,000 could not be raised. 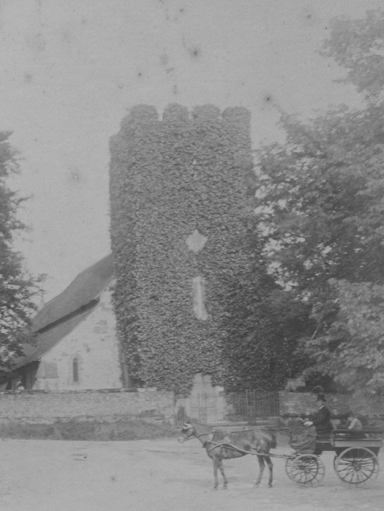 In the years leading up to its closure there had always been close co-operation between the Chapel and St. Mary’s church. Services were shared on special occasions and, when the Chapel closed, its Bible was passed to St. Mary’s for safe keeping where it remains a treasured possession. The names of a number of the local preachers who took part were also recalled: Alfred Burrage, Charles Brake, Benjamin Forder, Harry Hann, George Legg, Charlie Marriner, Charles Morris, Charles Phillips, Walter Smith and Henry Watts. Do you know any more about the history of the Church or the Methodist Chapel? Do you have any information about their roles in village life? 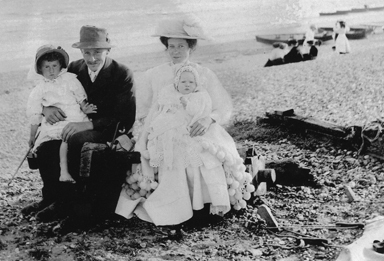 Do you have any old photographs of the buildings or of special outings and events?